I am often asked what could be at fault, my pictures sometimes freeze up or break up, can I repair it myself? Well, if you have some replacement equipment, it is just a case of elimination. The greatest tool a professional would have is a meter, to monitor the dish signal. But without one, there are a number of simple checks you can do, and it may save you replacing expensive equipment. Any of which will cause the symptoms above, if your installation is old, the cable is quite likely and not too costly to replace. The LNB is a complex piece of electronics and is outside in the heat of summer and the extreme cold of winter and of course the arch enemy of all electronics – water, may have penetrated the case or the cable. It would certainly be cheaper to replace the LNB at around £10, than to first try the reciever! The Technomate TM-1 is a good general purpose replacement for most LNBs. As a first step , reboot and retune the receiver and monitor the pictures for a while, have the break ups stopped? Dont forget of course the connections to all these items and especially the outside ones. Checking the alignment of the dish is easy with a meter, but a quick check using the signal display from the receiver is all that is needed to check alignment. Simply press gently with a finger first on the top edge of the dish, then the bottom, the west side and last the east side all whilst someone watches the display. A correctly aligned dish will show a dip in level as you push the dish off line in each direction. If the signal rises in any direction, it is in need of adjustment slightly in that direction, be careful not to overdo it, there are a lot of satellites close together, it is very easy, to stray into the path of the next one along. Having eliminated the cable, LNB, alignment and connections the receiver may be at fault, they are not repairable cheaply, replacement is the only cost effective solution. A common problem is capacitors in the power supply unit and although this may be easy to spot, as some capacitors ‘dome’ up making it obvious what has failed, but if the power unit has one failing capacitor bear in mind that all the capacitors are the same age and subject to the same conditions so just replacing one capacitor may not be enough. For the free channels the Manhattan XT range of receivers is a good replacement for your old receiver. 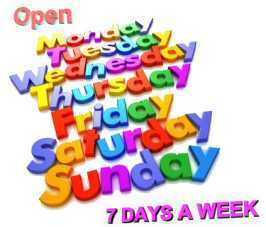 We can install 7 days a week !